With Christmas almost upon us once again, I felt a trawl through appropriately named fish might be in order if nothing else it will be more interesting than the Queen's speech, and hopefully almost as amusing as the jokes in a Christmas cracker. To kick things off, and help set the wintry scene, how about Echidna nebulosa, the Snowflake moray eel? This wonderful marine looks very dashing in what looks much like the same pattern used on the novelty socks I got last year. Thanks mum. More often called Lionfish, I think it's other more seasonally appropriate epithet of Turkey fish is more suited. Just don't try stuffing one with sage and onion, they won't like it and they're venomous. Apologies to the vegetarians among us - I couldn't find a nut roast fish anywhere. In an attempt to add a little sparkle to our festive scene, how about Grammicolepis brachiusculus? Known as the Thorny tinselfish, this shiny glittering beauty will really help dress the tree in the absence of bauble fish, (I did consider barbel but that's a bad pun too far even for me). The problem with trees is that they can be hard to come by in an ocean environment. Norway spruce just doesn't thrive when immersed in saltwater and I think those plastic ones are a bit tacky to be honest, so how about Spirobrancheus giganteus, the Christmas tree worm? OK, so it's not a fish, but it's available in a range of cheerful colours, it shouldn't drop needles all over the floor and best of all it won't end up sitting at the end of your garden until eventually you decide to set fire to it the following November under the feeble excuse it's bonfire night. Rudolf the red-nosed reindeer had a very shiny nose apparently, but Novaculichthys taeniourus doesn't, and neither does it bear much of a resemblance to any of Rudolph's other less famous friends. Maybe it gets its common name Reindeer wrasse from the two antler-like appendages that grace the head of juvenile specimens? Either that or from a lazy wholesaler looking for a way to shift a few of these at this time of year? Whatever the reason, don't expect these to pull your sleigh Santa or they'll be some disappointed kids this Christmas. Angelfish, Pterophyllum scalare, have to find a place in my list somewhere. It's not original, it's not funny and it's certainly not suitable for sticking on the top of your tree. There's always an argument in our house as to whether it's an angel or a fairy on the top of the tree. 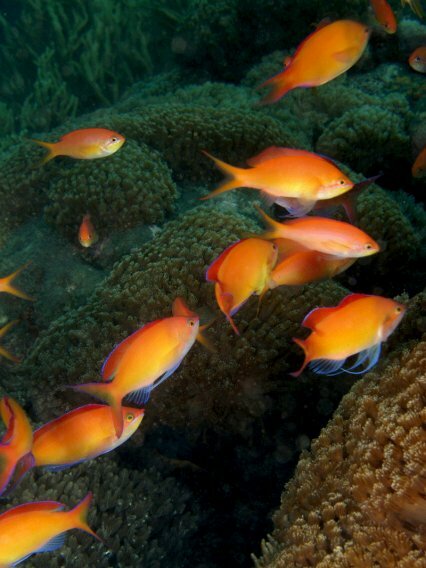 So, in the interest of balance how about Pseudanthias dispar, the Fairy basslet? Starfish? Yes, I know it's not a fish, but here's a nice big festive red and white one – with knobs on. Sorry. That sound you can hear is a barrel being scraped. Mesonauta festivus, the Festive cichlid has to be here with a scientific name like that. Quite what's festive about it I'm not sure, though. It doesn't have twinkly lights on it and can't sing carols from what I've seen. Perhaps it's dried and hung from trees in the Amazon at this time of year, or perhaps I have a too vivid imagination and it was just named after a Mr Festive? Finally the most Christmassy fish I could find, Nannosalarias nativitatis, the Christmas blenny. Found in the seas around Christmas Island in the Indian Ocean, it scores on both scientific and common name. It's also covered in flashing lights and shaped like a cracker while its mating call has been likened to a young Aled Jones. OK, so I made that last bit up, but as I haven't found a suitable picture to share with you all, you'll have to just imagine its Yuletide beauty. Have a happy fish-filled Christmas and new year.